Discover sturdy simplicity in a convenient and lightweight package. 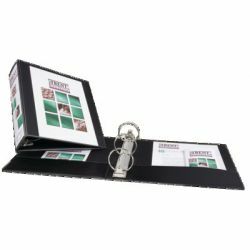 This Economy View Binder's 3" round rings hold up to 460 pages of 8-1/2" x 11" paper to offer a handy solution to your organization needs. Open and close the rings with ease to add or remove papers as needed. Tuck important handouts, pamphlets and other loose or unpunched paperwork into the two interior pockets for quick access. Perfect for light use, this slim binder is the friend your papers never knew they were missing.